Stage B at Microsoft Production Studios, the media hub for Microsoft International Headquarters, and a prominent user of Focusrite RedNet Dante™-enabled interfaces. Los Angeles, California, June 24, 2015 – Microsoft Production Studios, the media hub for Microsoft International Headquarters, has announced that it is expanding its collection of Focusrite’s RedNet audio-networking interfaces, the flagship Focusrite range based on Audinate’s Dante™ ‘Audio over IP’ protocol. In addition to RedNet 4 Mic Pre, RedNet 5 HD Bridge, RedNet 6 MADI units and RedNet PCIe cards already in use at the 65,000-square-foot complex on the software giant's Redmond, Washington state campus (which comprises four soundstages, sixteen edit bays and four audio studios), Microsoft Production Studios has taken delivery of eight RedNet MP8R 8-channel remote-controlled mic pre interfaces and will soon take delivery of one dozen RedNet D64R MADI Bridge interfaces. These second-generation RedNet units feature dual power supply and network redundancy for fail-safe operation. The new modules were sold through Seattle-based firm Lift AV. The RedNet D64R MADI Bridge builds on the success of the RedNet 6 adding power supply and network redundancy. D64R features sample rate conversion on inputs and outputs allowing MADI and Dante to operate simultaneously at different sample frequencies. The RedNet MP8R Mic Pre Amp is based on the successful RedNet 4 eight-channel Mic Pre Amp but is now housed in a 1U chassis. MP8R features selectable impedance for Mic splitter optimization and two Dante outputs - one direct and the other automatically gain compensated. MP8R is the first and only Dante Mic Pre to enable different brand digital consoles to be connected to the same device. MP8R may be discovered and routed directly from Yamaha® Cl/QL ranges. 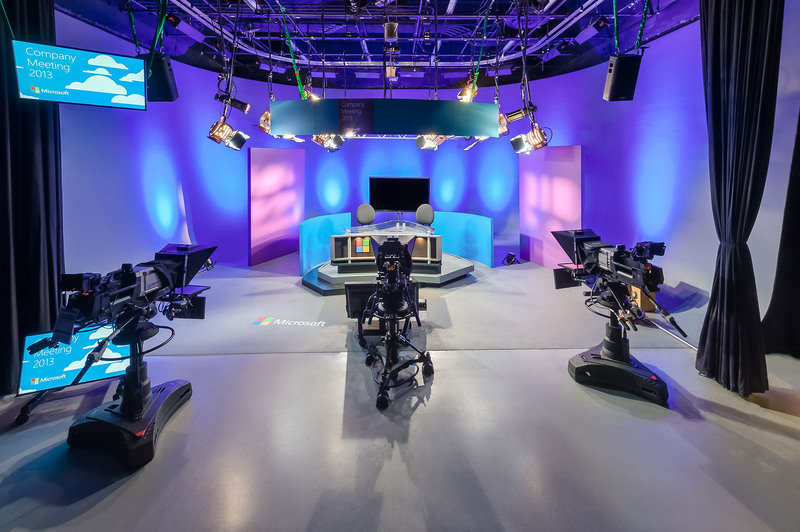 Photo Caption: Stage B at Microsoft Production Studios, the media hub for Microsoft International Headquarters, and a prominent user of Focusrite RedNet Dante™-enabled interfaces.